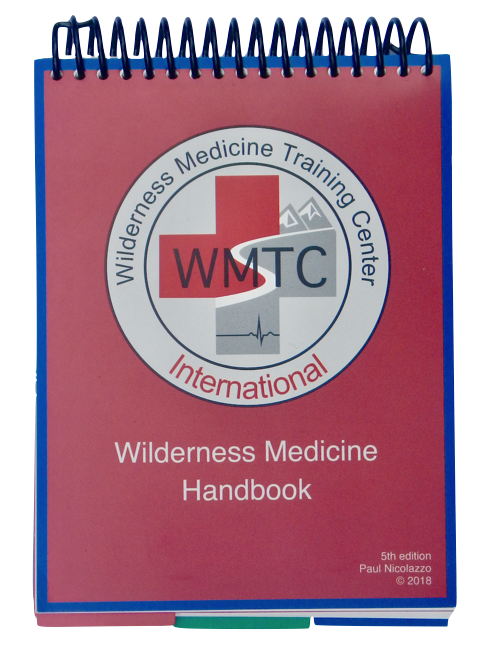 The 5th edition of the Wilderness Medicine Handbook is designed for field use. It is small enough to carry in your back pocket or life jacket and weighs only 4.5 ounces. The 4.25 x 5.5 x 3/8 inch 140 page handbook is printed on waterproof/tear-resistant paper and is almost indestructible. A plastic coil binding permits the handbook to remain open to the selected page. Similar to its parent text, problems are broken down according to their mechanism of injury (MOI): trauma, environmental, or medical with decision-making, tabbed indexes preceding each major section. Treatments are highlighted for fast identification. While the handbook briefly explains each problem, it does not delve deeply into anatomy & physiology, pathophysiology, or basic life support skills; users are expected to have a working knowledge of wilderness medicine. The completely updated and rewritten handbook has clear assessment photos, useful diagrams & charts, and expanded splinting, wilderness toxins, and medical section. Not merely another book, the Wilderness Medicine Handbook is a mandatory tool for all guides, trip leaders, and backcountry users. The 5th edition includes new topics, better diagnostic algorithms, and tabs to each of the three indexes: Trauma (red), Environmental (green), & Medical (blue) to make assessment that much faster. The covers and tabbed-indexes are slightly heavier stock to increase durability. This handbook should be part of every wilderness first aid kit. A more in depth digital version for your phone or tablet Wilderness Medicine Handbook v4.0 is also available with free updates for life.